"This is a great book and a must-read for anyone who wants tounderstand the young people who are now or will soon join the workforce. It'sone of the most useful value-added books about the Millennial generation." —Marshall Goldsmith, New York Times and Wall Street Journal #1 bestselling author of What Got You Here Won't Get You There and Succession: Are You Ready? 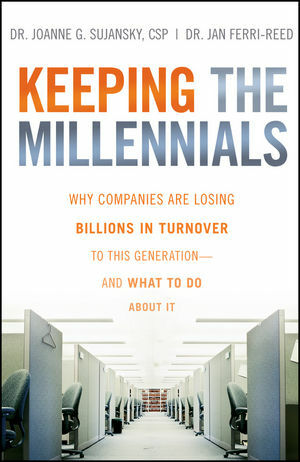 "Keeping the Millennials is a lively and insightful book that'sessential reading for every leader who aspires to enlist the hearts, minds, andspirits of a highly talented new generation that demands cool workplaces but is reluctant to make long-term commitments. Weaving together compelling cases and relevant research with illustrative examples and practical tips, Joanne Sujansky and Jan Ferri-Reed havewritten a balanced and indispensable guide to recruiting, retaining, and developing the workforce that will drive the future of our organizations and our economies." "I love this book!!! It's fresh as a breaking news flash and as fun to read as yourfavorite blog! Definitely rates an A+ as timely, targeted, and terrific. All managers will clearly see themselves and their employees in crisp new perspectives...and can easily latch on to precise tools to make their organization more competitive in a turbulent reality." "Corporations are always concerned about return on investment. Drs. Sujansky and Ferri-Reed have made a clear case about the bottom-line value of keeping Millennials—and creating productive workplace cultures for all generations. This is amust-read for anyone concerned about the retention of these key employees." 5 Creating a Millennial-Friendly Culture.